The Press and Canterbury Police conduct an experiment that shows you can drink heaps and not be over the limit . Then they tell the world about it. On the front page. Ten people each had between six and nine drinks over the course of 90 minutes. None felt they could drive safely – but only two blew over the 400mcg breath-alcohol limit. Jacob Atkins, a 42-year-old Christchurch builder, who drank seven vodkas, said he was surprised at how much he could drink and still be under the limit. "I wasn't even over 300 and can drive and be tiddly," he said. Carla Amos, 37, editor of The Mail community newspaper, who drank eight wines, said she thought she would have been over the limit early in the test, but was not. "It's scary that it says you can still drive," she said. One man found he "couldn't drink fast enough" to get over the limit. The point of this experiment is to build the case for lowering the blood/breath alcohol level from 0.8mg/ml to 0.5mg/ml. Look, they say. People are already drunk and driving legally. Now I don't know much about absorption and metabolism but I am certain tested later all of these people would have been over the limit. 8 glasses of wine? So what have they proved? That people can guzzle a huge amount and as long as they drive within 90 minutes they'll get away with it? In which case they may as well have told people to do just that. Don't worry about the happy hour after work. Fill up and then get home as quick as you can. Of course if we lower the level to 0.5mg then the same applies, but only drink 5 glasses of wine. I am extremely sceptical about these results and astounded the Police would think that publishing them was a good idea. Sue Bradford must be seriously 'conflicted' over Jeanette Fitzsimons position regarding topping up low income people for extra power/petrol costs created by Labour's carbon trading scheme. Fitzsimons is opposed because the incentive to save power would then be removed. Compare this to Sue Bradford's demands that the In Work payment also be paid to beneficiaries with children. Notice that then there would be no incentive for those beneficiaries to get a job. [Fitzsimons] believes that subsidising low income earners to help them pay for higher power bills which will be a consequence of the scheme, destroys the whole purpose of placing a price on carbon. Can you imagine Bradford saying, "I believe that subsidising beneficiaries to help them pay for child costs destroys the whole purpose of paying working parents more." Single Parenthood: Problem or Not? New research released from the long-term Christchurch Health and Development study has found, "significant associations" for 21-25 year-olds, "between exposure to single parenthood and anxiety disorder, achievement of educational qualifications, welfare dependence and personal income, arrest or conviction and self-reported violent and property offenses." However the authors conclude that single parenthood itself is not the problem. The problems arise from "social and contextual factors" associated with exposure to single parenthood. In response to the findings welfare commentator Lindsay Mitchell said, "These factors would include low parental education, low family income, and family violence. " "Unfortunately you can only separate out factors on paper. In reality single parents, low income and various forms of dysfunctionality often go hand-in-hand. I agree with Dr Fergusson that exposure to single parenthood does not guarantee later problems for children. But there is increased likelihood of them, as this research has confirmed." "In which case it is still a bad policy that encourages people to become single parents. The DPB has been instrumental in significantly increasing the number of single parent families and urgently requires an overhaul." This sort of nonsense has just gone too far. Gyms that have creches caring for children for an hour or an hour and a half tops need to have a trained early education teacher. Under Government regulations, all creches that provide education or care to three or more children under six years of age require a licence. They are required to employ a registered early-childcare teacher, develop education plans and programmes and provide suitable sleeping quarters for babies. This is exactly why we need a Regulatory Responsibility ACT. I wonder how many calls at a dollar a pop are logged in to Dancing With The Stars? Probably more than a million? From the last series $275,000 went to charity. Doesn't seem enough to me. And despite the contest appearing very tight throughout Suzanne Paul had it hands down. Of course if the public knew this they wouldn't keep voting. Her charity won more than half of the total raised. Interestingly the last series did not raise as much as the two previous. And I think I know why. I wasn't voting. Half a million customers and they don't pay tax. Hands up. I know next to nothing about tax law but it seems to me that Ngai Tahu Tourism is a business or a conglomeration of businesses. The profits are returned no doubt to the tribe but how is that any different from a group of shareholders? According to Te Puni Kokiri, Charitable trusts are normally formed to undertake charitable activities and are less suitable for commercial activities. Ngai Tahu Tourism doesn't pay tax because it is a charitable trust. Please enlighten me if I am missing something significant here. Is this some sort of affirmative action programme? I recently joined the Prime Minister in Patrick Street, Petone, to commemorate the centenary of the first state houses built not just in New Zealand, but the world. Patrick Street and the houses on it are an important part of New Zealand’s social history. Imagine my surprise when I saw Helen on telly last night again visiting the first state house in New Zealand. Twice in less than a year? Well, no. Not exactly. It's another 'first' state house. Just the same Prime Minister. 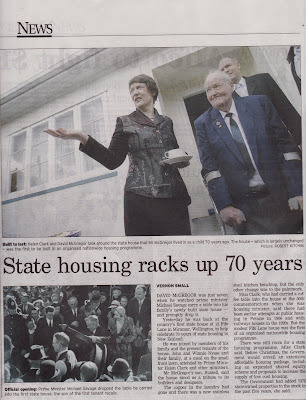 Today’s 70th anniversary of state housing in New Zealand highlights how an inspired policy from the First Labour Government in 1937 is still helping many New Zealand families, Prime Minster Helen Clark said today. The Prime Minister, Housing Minister Chris Carter, and Cabinet Minister and MP for Rongotai Annette King today marked the milestone anniversary with a visit to New Zealand’s first state house at 12 Fife Lane, Miramar, Wellington. They were joined by relatives of the first tenants at the house, and the family currently living there. Helen Clark said the anniversary marks an important turning point in New Zealand society when the First Labour Government, under Prime Minister Michael Savage, first began providing homes to New Zealanders. Labour didn't build the first state houses. At least they didn't build the "very first state housing" which is how the PM described the Patrick Street houses in October. See the subtle difference? I have little of import to impart this morning. But if you feel like a good belly-laugh have a read of this from the merciless Cactus. For those who want to keep an eye on government is up to I recommend this site - it's more straightforward and better presented than the parliamentary website which is also a mine of information. Jenny Chisholm, Letters September 17, questions the fact that 1 percent of children have a finding of abuse or neglect against them. She wonders how many more were not reported or investigated. Of all the cases reported last year just over half required further action. Of those investigated, only 37 percent resulted in an established finding of neglect or abuse. There is already a great deal of unnecessary reporting occurring. Of course 1 percent is not good. Zero percent would be. But 1 percent does not justify mandatory screening of every New Zealand child as is the Children's Commissioner's wish. Sunday media bombards us with opinion. Too much, which is an ironic thought from somebody who expends much time trying to get her opinion listened to. I have seen enough of the usual suspects rounded up to comment every time some crisis hits the leafy suburbs, and I am sure viewers were tired of hearing my opinions. That's why I quit television and radio commentary. There's rent-a-quote for every issue - Christine Rankin, Bob McCroskie, Garth McVicar, Mai Chen, Gary Gottlieb, David Farrar, Russell Brown, et cetera, ad nauseam. It's predictable, therefore unchallenging. Is this a crisis of confidence? DC doesn't want to do TV and radio but still wants to write opinion. I am sympathetic. Any rational person is mindful of how holding a strong conviction can look like obsession. Actually to keep going requires a certain obsessiveness. You can be very bruised by the inference and therefore dismissal that you are a quack, a nutter, or extremist. Take Garth McVicar and the hatchet job Steve Braunias did on him a couple of weeks back. What Grath did was decide to take his message to the public - not enough heed is paid to victims of crime. What could be wrong with that? Yet he is more often derided than supported. Bob McCoskrie, who I certainly don't always agree with, has nevertheless been doing a great job turning his convictions into action. Does DC really think people were bored with her views or has she just lost the zeal to put them in person? People deserve a break and she is entitled to 'retire' from public view but in the process it is somewhat churlish to criticise those who have not - or at least the process that airs their opinions. A good advocate should experience a tension between self-consciousness and courage of conviction. That keeps them grounded and human. It also made DC a good listen and a good listener. Personally, as mercurial as I sometimes think she can be, I think her radio and TV withdrawal is a loss.